There are some things you don’t question or plan for. They’re the things that just happen, that unfold throughout the day or week or month. The things we don’t always document or discuss because they don’t really seem important enough, but that — all the same — so often bring us together in one way or another. Patterns or obsessions or phases. Late-night online shoe shopping. Permission to nap at odd hours. Spontaneous cell-phone photo exchanges. Maybe you can relate. Maybe lately you’ve been doing something similar. As you do. As we do.Maybe you’ve spent into the double-digits (ouch) for 4 heirloom tomatoes because they’re beautiful and it’s summer and they taste like August and it seemed like a good idea at the time. Maybe you make friends with the mailman. Learn his name. Admit that you stalk him and then sheepishly take it back when he looks at you funny. You didn’t mean it that way. You just like mail. Regardless, he will, undoubtedly, take very good care of your outgoing letters. This is always a good thing. Maybe you find creative ways to feel close to loved ones who live far away. This could involve exchanging frequent foot photos. Somehow, this makes you both feel much closer. Maybe you play around with something you’re not all that familiar with on the weekends. Tinker. Perhaps it’s Polaroid film using a funny, bulky camera your dad got you for Christmas. Maybe you brave sunburns and play hooky for a dear friend’s mid-week birthday. Perhaps you obsess over something — or everything. Like the exact marigold tone on your new business cards. Or try to pretend you don’t have an addiction to a certain brand of shoes (I love you, Tom’s). You admit to yourself that you’re getting old and can no longer drink four glasses of wine and feel like a perky cheerleader the next morning. Heck, perhaps you admit to yourself that you never really felt much like a perky cheerleader in the first place. 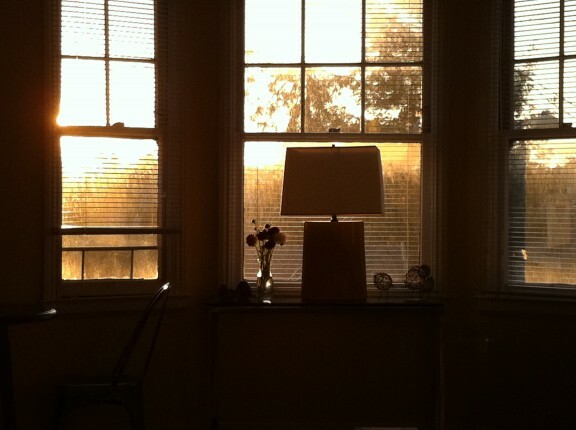 Sometimes you may sit and admire the early evening light inside your apartment. Then before you know it, you’ll begin taking early evening naps in said apartment. Maybe you write lists of restaurants you want to try. Like this one in San Francisco for brunch. Or this one in Oakland. Or this one, too. Also remind yourself to go see this museum exhibit before it leaves. And if you’re anything like me, you make zucchini bread when you simply have too much zucchini to stare at. Maybe you like adding chocolate to a recipe whenever you can. Maybe you like to have a guarantee that there is something special waiting in the kitchen to accompany your morning coffee. Because as the week goes on, things can get harried. 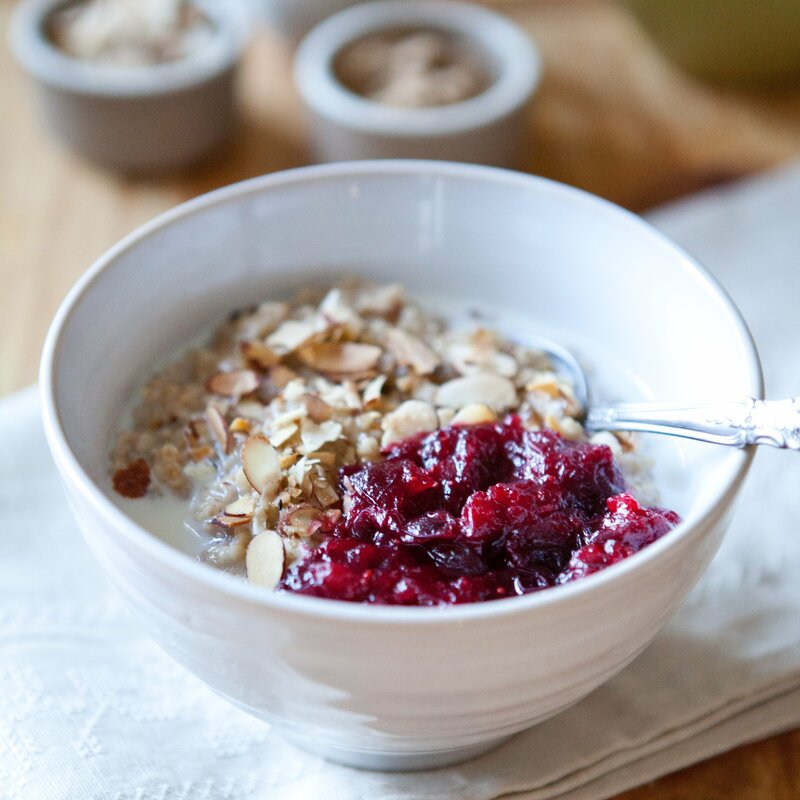 Good breakfast intentions are replaced, in my case, with no breakfast at all or handfuls of granola on the way out the door. But this week is different. I got into the kitchen. As you do. And for this recipe you’re going to want to as well. Let’s. This bread is a mish-mash of inspiration from a family recipe I often make along with a smidge of Lottie + Doof’s Zucchini Cake and Seven Spoons’ Chocolate Zucchini Bread. There are bits I like from each of these recipes, so I ultimately joined them to make a rather perfect, not-too-sweet zucchini bread with a very likeable, craggy top. It’s lightly scented with good cocoa, studded with toasty walnuts and cocoa nibs, and strewn throughout are bits of summer zucchini. With your favorite icing or a light glaze, this could even tread lightly into cake territory. For now though, I’m keeping mine for the mornings. 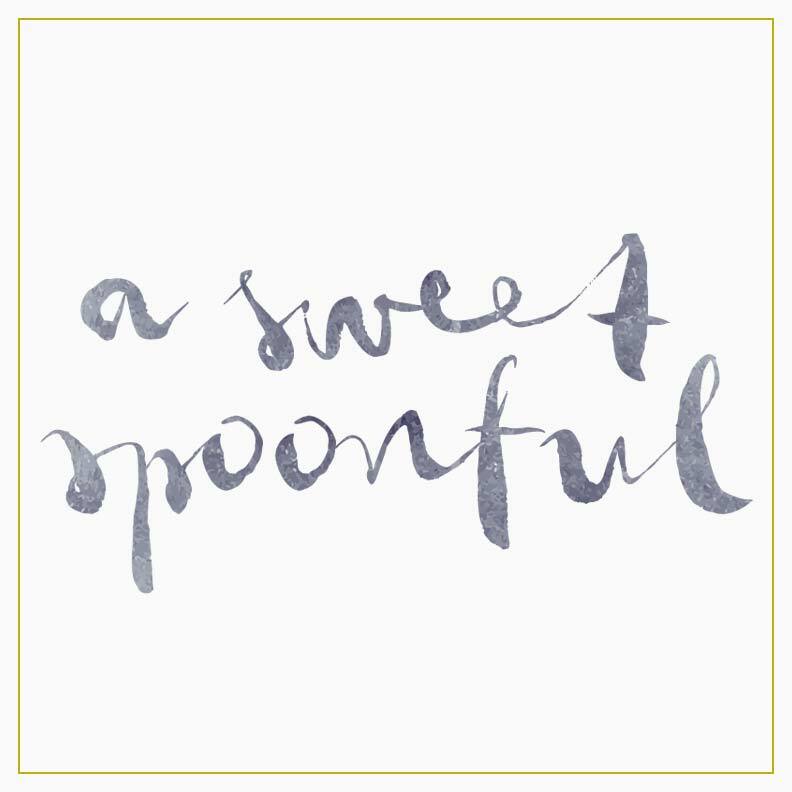 This recipe’s perfect for summer baking because you don’t need a mixer or electric beaters; you can do everything with a good, old-fashioned wooden spoon. Do use a nice dark cocoa powder–it’ll make a difference in flavor here. And if you’d rather use chunks of chocolate or chocolate chips instead of cocoa nibs, go right ahead. Or just leave them out altogether. Preheat the oven to 350° F. Generously grease two loaf pans (9 inches by 5 inches) with butter (or cooking spray, if you’d prefer). Toast the walnuts: on a baking sheet, spread them out and bake until golden brown and fragrant, 10-12 minutes. Cool and then chop finely. In a medium bowl, combine the flours, baking powder, baking soda, salt, and spices into a medium bowl. 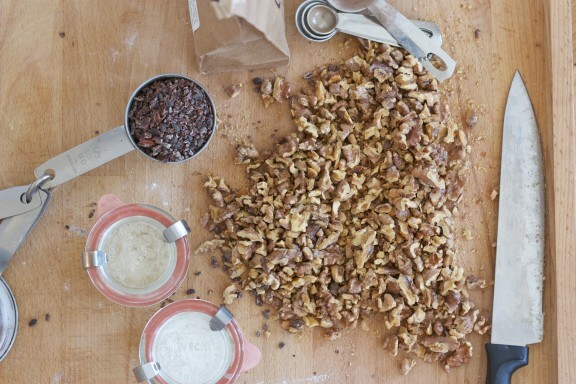 Add the cocoa nibs and chopped walnuts at the end and set aside. In a large bowl, stir together the eggs, olive oil, sugar, and vanilla. Add the grated zucchini at the end and stir until just combined with a wooden spoon or spatula. Combine the wet and dry ingredients, divide the batter into two prepared bread pans and bake for 45 minutes or until a toothpick or tester comes out clean. Cool for 20 minutes. Slice and serve. I have lots of zucchini waiting to be used and chocolate zucchini bread or cake has been in the back of my mind. Perfect! Thanks for this lovely peek into your every day. I especially like the part about foot photos. :) And I've spent way too much on tomatoes this summer, also, but I figure if I can't even remember the exact double-digit number anymore, then it was totally worth it. I mean, c'mon -- summer tomatoes! I so get it. I love reading your writing. It's soothing and inspiring and so wonderful. I've been toying with buying a pair of Toms. Are they comfortable? I love the concept, but want to make sure I'll wear them. Let me know. Marvelous, Megan. Every word. Every pic. I needed some inspiration, so I went back to the very beginning of your blog and re-read each and every title to the entries. It was time well spent, and I strongly suggest doing it for pleasure . . . It's amazing to see how your writing has developed over time. Thank you for sharing as you do. Beautiful post! I feel a tomato shopping spree coming on myself and I fully support your right to obsess over a shade of marigold. I adapted Lottie+Doof's recipe and loved it, but your chocolatey bread/cake sounds fantastic. 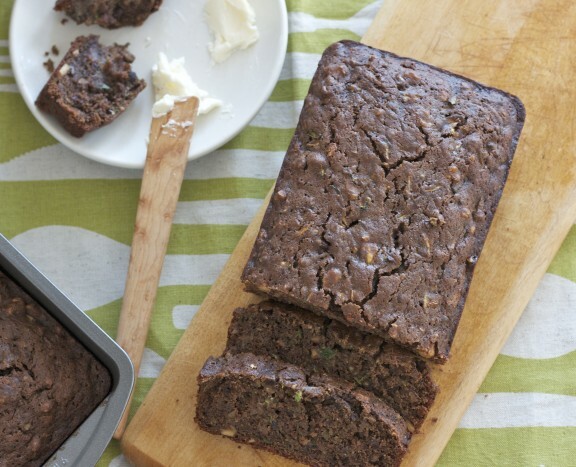 Love this nutty zucchini loaf! Beautiful texture. You've pointed to a good exhibit. I want to visit again before it is gone. It might be a good idea for me to replace yesterday's bear claw and today's chocolate croissant (vacation breakfasts) with your more respectable Chocolate-Zucchini Olive Oil Bread. I'll be back in my own kitchen tonight and this bread looks very appealing. I can't wait for my csa to get into full zucchini mode. This bread will be made as it looks fantastic. And Tom's shoes - I've been lusting for a pair and may have to get some soon. Right? Right. Try to catch the Steins Collect exhibit if you can...worth the visit. The story behind the exhibit--the Stein family, their relationships with each other and the artists--was almost more interesting to me than the art itself. You guys are too cute with your shoe pics! So many more cute styles of Toms are coming out, too. Uh oh. 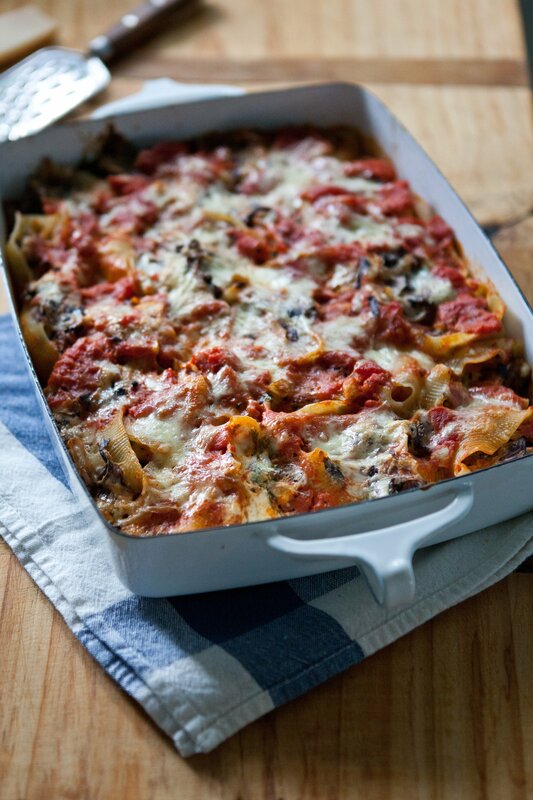 Jacqui: Yes to summer tomatoes is right! Janet: Would take a sunburn anytime to get to spend a whole day pool-side with you. Katie: Yes, so looking forward to the exhibit! Jeannette: Tom's. Do it. They're amazing. Lori: Surprisingly comfortable, actually. They do have some support and aren't flimsy like ballet flats. Try them! I love all of those photos of the feet! Chocolate, always a good thing on a Friday. :) And I, too, am obsessed with my Toms. I reckon I need 3 more pairs, at the rate I'm going! Just seeing that early evening light makes me want to lay down with a good book! A perfect photo. I'm allergic to walnuts (sadly) - do you think this recipe needs some other element of texture (e.g. crystallized ginger, chocolate chunks, pumpkin seeds)? Megan, your photography is such an inspiration to get out my camera! And your story is incredible to me because it is so similar to my own story of my southwest honey (I am on the east coast). He and I had the same instant magnetism you and Sam have. When did your relationship begin? Hi Marianna. Sam and I started talking on the phone in late February and he came to visit in early April. Thankfully we don't have a time change to contend with like I'm guessing you do... Thanks so much for the sweet comment. 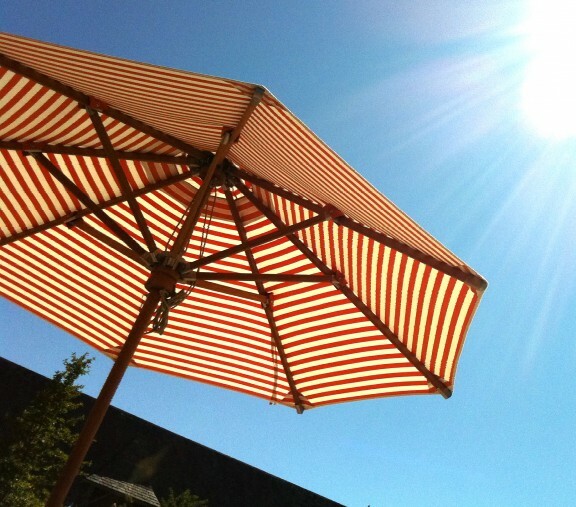 You've captured exactly what summer feels like, Megan: a series of inclinations, habits and flirtations that you drift among while the sun warms your back. I love this post. Love the foot photos, too adorable! We're expecting a bunch of heirloom tomatoes to ripen in our garden over the next few weeks, happy to share the love! And I've never had zucchini bread in my life - am I deprived? Hi D! Well zucchini bread's pretty great. Try it. I think you really need toasted walnuts or something for a bit of texture otherwise it always seems a little flat/disappointing to me. I've never had chocolate zucchini bread before but this looks delicious! And I love being able to just use a wooden spoon when baking, it's almost like it's easier to bake a little love into it when it's hand mixed .. This looks killer, Megan! I've a box of cacao nibs that I got at BlogHer Food that have been screaming to be used up; now I've a purpose. Now I just need time to get in the kitchen to bake this gorgeous looking zucchini-chocolate bread! 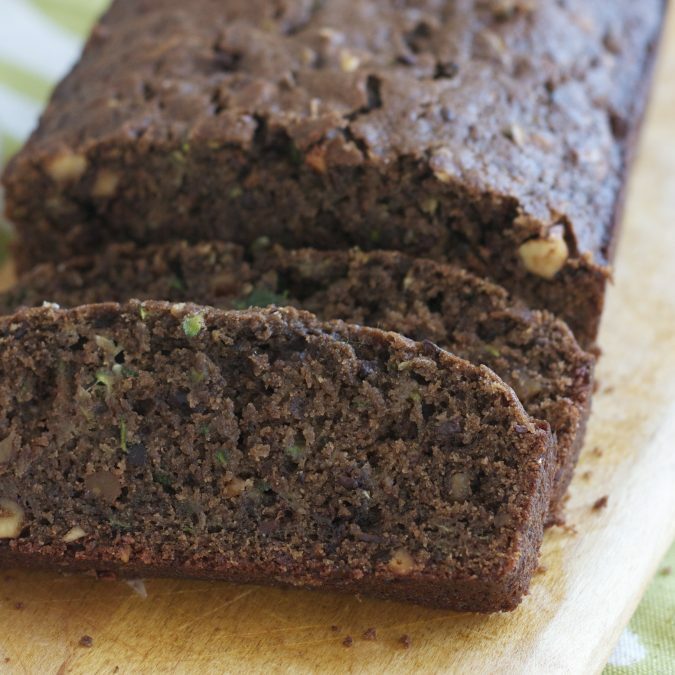 Lovely words and thoughts - I'm trying your Chocolate-Zucchini Olive Oil Bread today! My husband loves chocolate zucchini bread! I have a recipe that I use but I wasn't a big fan of it myself. I might need to try this one. Thank goodness for another zucchini use. Overloaded here! Made this loaf today, substituting almonds for walnuts, which would have tasted better. I also did not have ginger and nutmeg, so sprinkled in some cinnamon instead. Zest from one orange was added as well. My husband loves eating his zucchini in this form! It takes self-control, staying away from that loaf! Hi Kristina. That sounds fantastic. I'll have to try it with orange zest next time! I love the part about having something wating for you in the kitchen to accompany your morning coffee. There have been so many mornings that I have dreamt of having a warm bagel with nova and creamcheese that I can eat slowly while sipping my coffee. I think I will try this bread it might fill the lingering nova holes in my heart! Megan - made the loaf with pepitas this weekend and it turned out very well! I also sprinkled some on top before sticking the pan in the oven and it turned out beautifully with the green seeds on top of the darkly chocolate brown loaf. Thanks for a great recipe. This was really good; good cocoa is a must! My only subs were all whole wheat flour and palm sugar for the white sugar. It is so delicious! That is an extremely smartly written article. I'll make sure to bookmark it and come back to read more of your useful info. Thanks for the post. I will certainly return.